Provide a forecast of what the workforce demand would be over a five-year period to produce and market your team’s technical application or process. Include the impact such production would have on the marketplace. 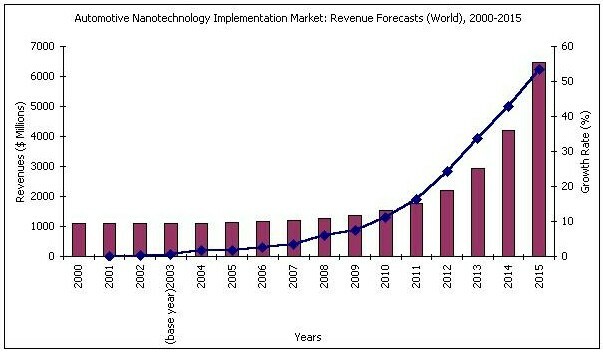 Nanotechnology, considered "the next revolutionizing frontier of science", is an advancing industry facing rapid growth in the next five years. Projected to become a $1 trillion per year industry, research and development for these technologies is actively being financed by the governments of Japan and the United States. New developments can be expected to generate global growth in a variety of fields. 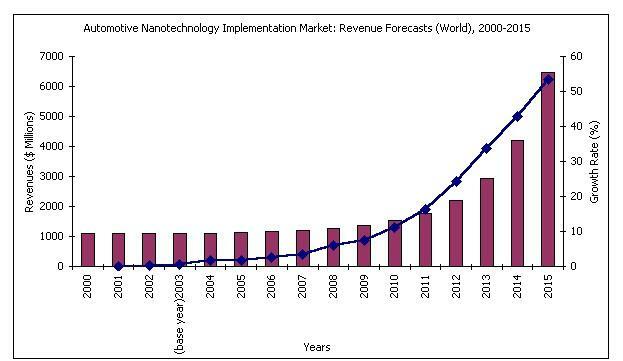 Our product will most likely increase demand for employees in the nanotechnology industry. In the automobile manufacturing industry, flat glass producers made $3.8 billion dollars in 2005. 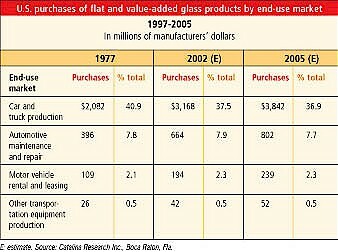 Enhancements to glass like our product will supplement existing products, producing no apparent increase in consumption. A minimal impact on employment in the glass manufacturing sector would be expected with a marginal increase in employees who would specialize in the application of our product. Our product with the potential to reduce accidents may become federally mandated or may be required by insurance companies in new vehicle models. A comprehensive requirement like that would dramatically increase our products deployment and reduce the manufacturing costs on an economy of scale. The automobile industry as a whole will utilize nanotechnologies like our product in order to become more cost effective. This trend can be seen in the graph below. Overall nanotechnologies are going to revolutionize the technology sector of the economy, leading the way to developments like our product. The greatest growth will be concentrated in the countries currently investing in research. The enhancements in safety, and driver comfort from the reduction of glare will secure our product as a valuable automotive feature for many years to come. a brief description of the program of study. Due to the scope of our project, we felt it was necessary to examine three undergraduate programs to solidify the varied pre-requisites present in our technical application. Optics and photonics will play a critical role in enabling the development and refinement of manufacturing during the 21st century. Optical engineers use the discoveries of scientists to design and create optical equipment that advances industry and improves life by making products that are safer, faster, and easier to use. Click on each course title to see a detailed description. Introduces the quantum mechanical concepts and the band theory of solids at the level necessary to understand the physical properties of materials. Provides students with a fundamental understanding of the important physical (electronic, dielectric, optical, and magnetic) phenomena in various classes of materials (metals, semiconductors, ceramics, and polymers). Introduction to applications of geometric and physical optics to engineering, including optical measurements, matrix methods, instruments, interference, holography, beam optics, Fourier optics, and diffraction. Principles of wave propagation, coherence, polarization, diffraction, and Fourier Optics. Laser theory including the interaction of light with matter. Principles of optical and optomechanical design including tolerancing, specification, and thermal compensation of systems. North Carolina State's undergraduate program in materials science and engineering focuses on understanding the structure, modification and properties of materials, and the development of new or improved processing methods. This program also offers the newest information for material engineering to keep the students up to date with the new technology. Click on each course title to see a detailed description. An introduction to the atomic and grain structure of structural materials emphasizing the mechanical properties. Effects of mechanical and heat treatments on structure and properties. Fatigue and creep of materials, fracture toughness, mechanical and non-destructive evaluation, effects of environment. Design considerations, characteristics of metals, ceramics, polymers and composites. Exploration of the role of materials in the development of modern industrial civilizations by putting technology into a historical context and examining the advances made possible by innovations with materials starting with the Stone age. Basic concepts in materials science and engineering which focus on the relationship between processing, structure, properties and performance. Material classes covered include metals, ceramics, polymers, composites and semiconductors. Treatment of the role of electrons and electron energy (band) structures in determining the fundamental properties of materials- electrical, magnetic, optical, and thermal. Introduction to quantum mechanics; Brillouin zones; band structures. Theoretical and phenomenological basis of each property as manifested in various classes of materials; examples and demonstrations of technological applications. Covers fundamental topics in stress analysis and mechanics of materials including statics and structures, elasticity, plasticity, fracture, fatigue, testing methods, and engineering applications. Computer applications for processing and analyzing materials data and performing materials design and modeling calculations. The Niagara College in Canada specializes in educating prospective students in the field of photonics. Students are trained in the development and technology of photonic systems as they also explore the science of harnessing and developing light. Graduates are prepared to pursue careers in optical coatings and optical hardware design. Click on each course title to see a detailed description. This course provides the student with a solid understanding of advanced optical theory. Topics covered include: wave kinematics; geometrical optics; basic concepts, ray-tracing and matrix formalism, Gaussian imaging by thick lenses, stops, and apertures, and intensity relations; interference; interference spectroscopy and coherence; diffraction: Fresnel-Kirchhoff formulation, Fraunhofer case, Fresnel case, and holography; polarized light. This course introduces students to the theory and practice of high vacuum systems as employed in gas discharge tube processing (including laser tubes) as well as thin-film deposition systems. Students will study the physical behavior of gases and the technology of vacuum systems including system operation and design. 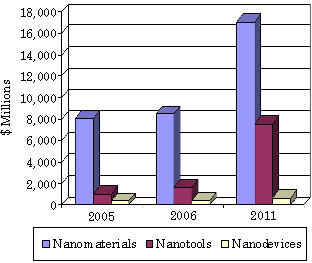 Attention will be paid to issues of gas purity and sources of contamination with residual gas analysis and the broader technique of mass spectroscopy used analytically. Aside from applications in gas discharge tubes, the other primary application of high vacuum technology, thin film deposition, will be covered including evaporation and sputtering techniques. The theory and design of optical coatings and structures such as antireflective coatings and multilayer dielectric filters and reflectors will be studied. In this course, students will learn about the physical concepts of energy, waves and optics, using a combination of lectures and experimental (lab) investigation. Students will study the principles of wave motion. Physical optics will be examined as applied to refraction and reflection, lenses, prisms and mirrors. The electromagnetic spectrum will be introduced, as well as, interference, diffraction and polarization of light. In addition the quantum mechanical nature of light, photons and the photoelectric effect will be investigated. This course introduces a calculus based treatment of the material to be covered. Develop an idea for a new science and/or engineering degree program that might emerge given the advancements in scientific knowledge that the team has identified. Provide a title and 100-word description of this new degree program. In addition to building a basic background in optical technologies and sciences, our graduate program Optical Design and Manufacturing Technologies (ODMT) will enable our students to design, manufacture, and modify our product. The research we conducted will hopefully instill a better understanding of the optics, materials, and design involved in windshield manufacturing. We have developed a comprehensive degree program for those who wish to seek further education in this particular optics-based technology field.